Perhaps the best way to describe director/star Ben Stiller’s mini-epic is to visualise what it would be like if Wes Anderson was given a larger budget. However, the Moonrise Kingdom director – who had Stiller as part of his cast ensemble for The Royal Tenenbaums – likes to keep things fairly balanced with its style and tone when it comes to making his own movies (one of the many reasons why Moonrise Kingdom remains perhaps his most powerful film yet). Stiller clearly has ambition with his fifth film as director, coming in the wake of more definable comedies Zoolander and Tropic Thunder, but the payoff is not so even. It has its uplifting moments, but also parts that really stretch your suspension of disbelief even in the film’s numerous fantasy segments. 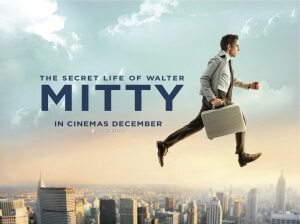 In short, The Secret Life of Walter Mitty is a mixed bag, but an enjoyable mixed bag. The first thing to take into account is that the film is shot absolutely beautifully. The cinematographer’s name is Stuart Dryburgh, and he brings colour and life to even the most minimal of locations – the streets of New York, for example, look divine in faraway shots and sometimes aerial ones – allowing characters and audiences to breathe within the confounds of its giant atmosphere. When the film shifts to the protagonist’s international adventures in Greenland and Iceland (and later others, without spoiling anything), everything from the luscious mountainsides to a comically tiny airport is wondrous to look at, and it is clear that Dryburgh has as much a visual eye for the film as director Stiller does. Past experience on arthouse movies like The Piano and The Tempest certainly help, bringing those luscious visuals to a bigger movie giving it the crisp beauty that it deserves. A small ensemble cast that includes Kristen Wiig, Adam Scott, Shirley MacLaine and Sean Penn lights up the screen whenever possible, even though they – MacLaine and Penn in particular – do not have much material to wrap themselves around. It’s Stiller who unmistakably takes centre stage here as the titular character whose daydreams and ultimate desire for real adventure define an otherwise bland role. He does fine in the role, though again nothing outstanding, but taking on the main role in his own project can lead to some easy accusations of vanity and self-indulgence on his part. In some respects, you can understand their viewpoint: the film continuously depicts Mitty as some sort of God amongst men, surviving shark attacks and volcanic eruptions while also imagining himself as a handsome and charming mountaineer and later as a superhero. Heck, Stiller’s face is plastered all over a fictional LIFE magazine cover at one point; just put him on Mount Rushmore and the ego-stroking would be complete. But Stiller is thankfully able to allow others rule the roost on-screen, particularly Dryburgh’s cinematography and Penn’s small but memorable appearance. As a director, there’s no denying that Anderson must have been some sort of creative influence for Stiller. Almost every shot seems to be heavily detailed with things in either the foreground or background sticking out, ensuring multiple viewings and appreciations to spot them all. This could again come down to Dryburgh’s cinematography, but it reminds one of Anderson and his visual stylings when this film has a go at it. One particularly Anderson-esque moment is the sequence wherein Walter Mitty travels to Greenland. Set to Arcade Fire’s anthem “Wake Up”, the various tracking shots are layered with carefully-placed on-screen text that enforce – maybe to an extreme, but that’s personal taste – the film’s message about life itself. At one point, a line pops up in the airplane’s “No Smoking” and seatbelt signs. The sequence as a whole is heavily reminiscent of the Darjeeling Limited director’s style of work, and it is a good imitation without being a straight rip-off either. One of the biggest problems with the movie, however, is its constant shifting of its tone. It has elements of both comedy and drama, and so desperately wants to accommodate both simultaneously but it seems there is usually room for just one. If this film went in with the intentions of being an all-out comedy in the vein of his previous films Zoolander, Tropic Thunder, The Cable Guy et al, then it does not accomplish this as it says what it wants to say in all seriousness. It definitely feels like a drama, but there are some obvious comedic insertions into the mix which makes it all feel uneven. The most notable example of the latter comes after a warm, grounded conversation between Mitty and Wiig’s love interest Cheryl. As soon as it ends, Mitty begins to imagine the end to a cheesy romantic comedy which suddenly, out of nowhere, turns into a full-on parody of The Curious Case of Benjamin Button. It is clearly going for laughs, and admittedly the unexpectedness of the moment does make it bizarrely hilarious, but it feels like it would fit more into something like Tropic Thunder than it would an otherwise po-faced flick like The Secret Life of Walter Mitty. It’s one of many moments that don’t exactly define the film’s overall feel, and oddly enough many of them come from the protagonist’s imagination sequences. During the film’s first half, whenever a moment feels more over-the-top and crazier than before, it’s obvious we’ve entered another one of these moments which takes away the surprise element they are supposedly going for. Again, they all seem to be played for laughs and heavily distract from the film’s more serious tone. Mixed tone aside, the rest of the film does a good job standing on its own two legs. It will ultimately divide moviegoers expecting another Stiller comedy, but with The Secret Life of Walter Mitty he is clearly stretching out to reach for new territory as a director with a heavily stylised but pleasant to watch look to it all. It is, to put it bluntly, the finest big-budget homage to Wes Anderson for a long, long while. The Secret Life of Walter Mitty never does quite reach its full potential, only held back by a distractingly inconsistent tone, but thanks to Ben Stiller’s directorial vision, a fine supporting cast, and especially Stuart Dryburgh’s wondrous cinematography, it holds up fine and should serve as a sweet crowd-pleaser over the Christmas period. It’s certainly a secret life worth discovering.